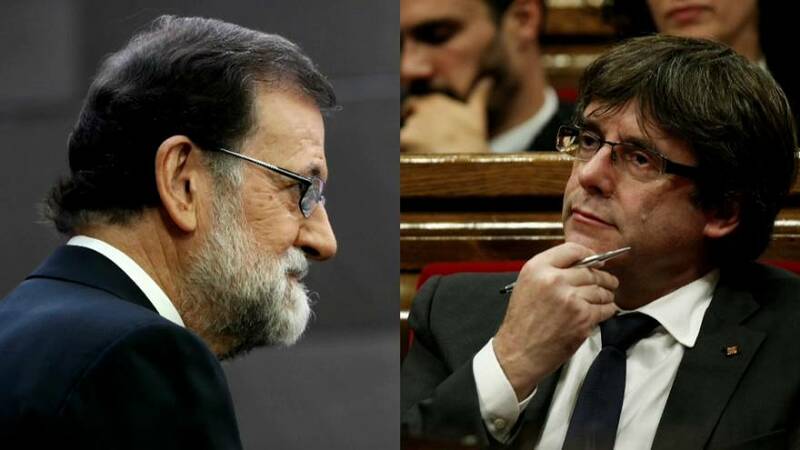 Mariano Rajoy and Carles Puigdemont: two leaders who, diametrically opposed to each other, symbolise what has largely been a stand-off in Catalonia in the weeks since the controversial referedum on October 1. However, the constitutional crisis has now escalated to a situation where the consequences are immediate and fraught with danger. Friday’s events have put the two sides on a collision course. The Catalan regional parliament voted to declare independence from Spain. Shortly afterwards, the Spanish Senate approved measures allowing Madrid to impose direct rule over Catalonia. Article 155 of the Spanish constitution has been described as the government’s “nuclear option”. It gives Madrid the power in a crisis to take “all measures necessary to compel” a region to meet its obligations. The first measures could involve sacking the Catalan government. Madrid would also be able to take control of the region’s police and finances – although the possibility of taking over public media has been rejected. Spain’s prime minister wants the power to call regional elections in Catalonia within six months. Mariano Rajoy has also called for all senior functions currently exercised in Barcelona to be taken over by Madrid. But how it all plays out in practice is uncertain – especially as any concrete move from Madrid would likely face significant opposition. Separatists have warned of possible widespread civil disobedience. The future of Catalonia’s regional police force, the Mossos d’Esquadra, could come under the direct national control. Its chief, Major Josep Lluis Trapero, faces removal. He has already been charged with sedition by Spanish prosecutors for failing to prevent this month’s referendum and is awaiting trial. Catalan media are set to become the forum for an intense battleground of opinion – but they will not be coming under Madrid’s governance. In the Senate the governing Popular Party (PP) accepted a socialist amendment to keep the media out of Article 155’s scope. The main regional television channel TV3 has already been accused of being biased – both in favour of, and against, independence. Catalonia’s Vice-President Oriol Junqueras, who had said the use of Article 155 meant independence was the only remaining option, tweeted after the regional parliament’s vote that Catalans had “won the freedom to build a new country”. The obstacles are formidable: and independent Catalonia has zero international recognition and faces total opposition from Spain’s central government. The European Union has made clear its support for Madrid. Observers have questioned how a viable independent state could operate in such circumstances, outside the EU. Friday’s directly opposing moves from the national and regional institutions were decisive – but create still heightened uncertainty over what will happen on the ground in Catalonia. Its society remains severely divided.